There are four main areas for advocacy and policy reform: Diagnosis and Treatment, Education and Prevention, Identification of Treatment Options; and Legal Reform. 1. Standardized Measurement: Currently there is no standardized measurement and reporting of maternal depression screening/mental health assessment. Encourage health insurers to implement and report a HEDIS-like measure from the NCQA-ACOG maternity care guideline measure for mental health assessment and screening during the first prenatal visit. Without measuring and reporting these rates, these disorders will likely continue to go largely unnoticed. Federal SAMSHA consensus statement on mental health treatment and recovery. 2. Change Systems to Bring Screening to All: OBGYNs currently list a range of barriers to providing mental health screenings during pregnancy and the postpartum period. This includes, not feeling qualified to conduct screening, not having enough time to conduct screening, not being reimbursed for screening and not knowing where to refer patients who screen positive. Those who do conduct screening have reported not using a depression screening tool that has been validated for use during pregnancy/postpartum. Additionally OBGYNs generally see a patient just once during the postpartum period, at 6 weeks. Furthermore, Pediatricians who see women during the postpartum period report the same barriers to screening, and also run into the added barrier of scope of practice (the mother is not the pedestrian’s patient, the baby is). This complex set of challenges requires out-of-the box policy solutions, including considering promotion of health insurer conducted screening bringing screening to scale and assisting overburdened physicians. Given the shortage of psychiatrists in the state, insurers should also be encouraged to contract with psychiatric consultation lines to provide OBGYNs speedy access to the latest research relative to drug therapy during pregnancy, and any possible drug-alternative FDA approved treatment options. 3. Social support: Women without social support networks are at a greater risk. Increase access to social networks for expecting and new mothers through hospital based classes, including exercise and walking groups, and on-line groups. 4. Intensive Treatment Programs: Advocate for additional hospital based inpatient and outpatient maternal mental health treatment programs. Currently CA has two outpatient/inpatient programs, in El Camino and Long Beach. There are less than 20 programs in the U.S.
1. Public Education: Lack of understanding and social stigma of mental health disorders prevent women and families from understanding the signs, symptoms and risk factors of maternal mental health disorders, which could help them take precautionary steps to reduce risk, and reduce stigma and misunderstanding about maternal mental health disorders. Inform mothers and families of the health risk to her infant and children if depression and other maternal mental health disorders go untreated. Evidence suggests this information will compel a mother to seek help over improving her own health. 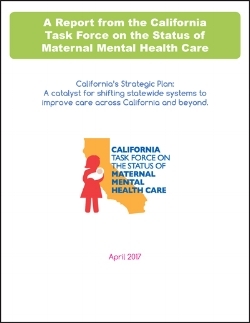 Consider development of a state-wide or national maternal mental health awareness campaign that could be adopted by counties in various forms/media. 2. Encourage hospitals to take preventive steps in implementing things such as: (1) protected sleep times (to reduce the sleep interruption and insomnia surrounding birth), (2) include overview of maternal mental health disorders including symptoms, triggers and risk factors, and area treatment programs in birth class curriculum, and handouts to mothers when registering (3) training of hospital staff that interact with new mothers including MDs, lactation consultants, nurses and others and (4) providing new mom and baby classes for mothers postpartum including exercise and walking classes, which can help mothers increase social support and reduce anxiety related to baby care, and more. 1. Provider training: Many family practice/OBGYN and ER physicians explain that they don’t feel qualified to screen or treat maternal mental health disorders. Social workers and first-responders also are often unaware of the signs and symptoms of maternal mental health disorders. Often women fear admitting depressive symptoms out of fear of her children being taking away from her. Advocate for including adequate maternal mental health training as curriculum for medical and social work school programs, and first responder training. 2. Certification for qualified mental health providers: Encourage establishment of a testing/certification program for mental health providers who have received additional training in maternal mental health so well-informed professional services can be easily identified. Ask health insurers to implement their own verification process in the absence of such a certification, as a starting point. Insurers should consider testing whether offering higher rates of reimbursement increase the number of trained providers. 3. Centralize latest research on proven therapies in addition to drug therapy and psychotherapy and encourage insurers to cover these alternatives for maternal anxiety and mood disorders when appropriate, including treatments like: Electro Convulsive Therapy, Sleep Therapies, Omega 3s, Mindfulness Meditation, Outdoor Walking with Other Moms, and more.